"Abomination to God" scriptures are not necessarily pleasant to read but He put these in the Bible for a good reason. If we have unrepentant abominations to the Lord in our lives, we will not be written in the Book of Life (Revelation 21:27). Do not envy a man of violence and do not choose any of his ways, for the devious person is an abomination to the Lord, but the upright are in his confidence (Proverbs 3:31-32 ESV). 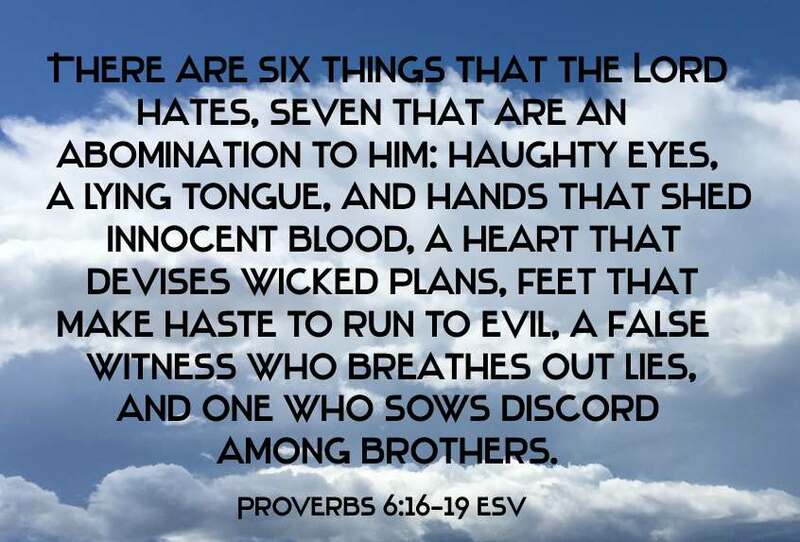 There are six things that the Lord hates, seven that are an abomination to him: haughty eyes, a lying tongue, and hands that shed innocent blood, a heart that devises wicked plans, feet that make haste to run to evil, a false witness who breathes out lies, and one who sows discord among brothers (Proverbs 6:16-19 ESV). Hear, for I will speak noble things, and from my lips will come what is right, for my mouth will utter truth; wickedness is an abomination to my lips (Proverbs 8:6-7 ESV). Those of crooked heart are an abomination to the Lord, but those of blameless ways are his delight (Proverbs 11:20 ESV). Lying lips are abomination to the LORD: but they that deal truly are his delight (Proverbs 12:22). The sacrifice of the wicked is an abomination to the LORD: but the prayer of the upright is his delight (Proverbs 15:8). The way of the wicked is an abomination to the Lord, But He loves him who follows righteousness (Proverbs 15:9 NKJV). The thoughts of the wicked are an abomination to the LORD: but the words of the pure are pleasant words (Proverbs 15:26). Everyone who is arrogant in heart is an abomination to the Lord; be assured, he will not go unpunished (Proverbs 16:5 ESV). He who justifies the wicked, and he who condemns the just, Both of them alike are an abomination to the Lord (Proverbs 17:15 NKJV). The sacrifice of the wicked is an abomination; how much more when he brings it with evil intent (Proverbs 21:27 ESV). The devising of folly is sin, and the scoffer is an abomination to mankind (Proverbs 24:9 ESV). Whoever hates disguises himself with his lips and harbors deceit in his heart; when he speaks graciously, believe him not, for there are seven abominations in his heart (Proverbs 26:24-25 ESV). 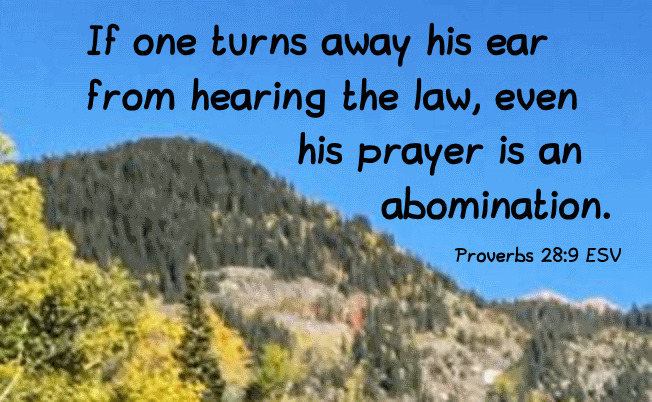 If one turns away his ear from hearing the law, even his prayer is an abomination (Proverbs 28:9 ESV). An unjust man is an abomination to the righteous, but one whose way is straight is an abomination to the wicked (Proverbs 29:27 ESV). But there shall by no means enter it anything that defiles, or causes an abomination or a lie, but only those who are written in the Lamb’s Book of Life (Revelation 21:27 NKJV).